At the stroke of midnight as April 14 turns into tax-day, the Inflatable Squirrel Carcass welcomes John Schnall back to the airwaves. John will be presenting a brand new Midnight Matinee for your edification. 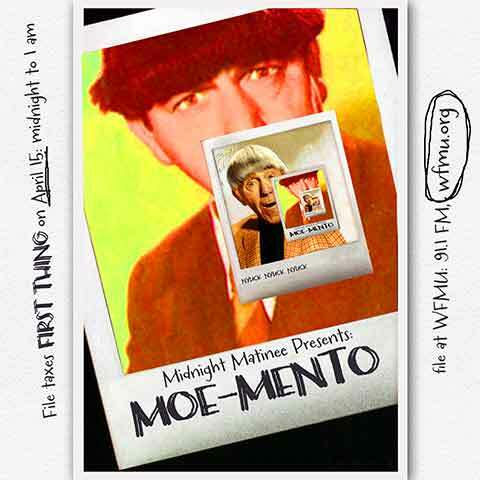 This episode will feature the film Moe Mento, documenting the short-term memory loss that is a direct result of being hit on the head with a hammer, gouged in the eye, slapped in the cranial area and otherwise Stooge-handled. Featuring extensive research from the NYU College of Konks Squared (aka NYUCK NYUCK). Love Is All Rumours (Listen: ) A Hundred Things Keep Me Up At Night Whats Your Rupture? I am here too soon. I forgot what I was going to post. Thanks for having me, Rich; that was fun! Oh this is going to be one of those nights. HELL YEAHH. killing it. flogging it's dead corpse. putting it in an unmarked grave. This song is from Jack Spillum, a frequent Midnight Matinee contributor. I just thought you'd want to know that. good morning john, ian, ?, et al. did they set fire to dali's giraffes also? Damn monkeys; don't trust 'em. The baby monkeys in that movie had makeup put on them to make them look more like missing links, rather than pure monkeys. I wonder how hard it was to put makeup on monkeys. I wonder if Kong had any daughters? I bet they have an interesting story. Hooray for more Midnight Matinee! I'm loving this. you think they're proud of their brother or did he disgrace the family name? I bet they're kinda proud, but it's tempered with an awareness that he's the golden boy who gets all the attention while they have to pick up banana peels off the floor all day. this is actually a pretty good remaking of memonto as an audio play. Oh no. It wasn't the airplanes that got him. It was merchandising killed the beast. mr schnall you dont know how many years i listened to your show. its great to hear it back on the FMU airwaves. it use to be sunday midnight into monday. well i am enjoying this a lot. fer reals. nick in hudson that is exactly the case. does anyone remember "the sub genius hour of slack" i think it was the show that followed "movie matinee"
well, it's not the LAST thing i do remember. I'm reperating the lyrics of this into an online dating chat, it's actually not going that bad. now it got all joe frank. Well it was fun while it lasted. Im amazed when anything happens at all, no worries. sometimes nothing just lasts a really long time. he wanted to get the chicken on the other side. relax and float. I keep tensing up because this show is...... hahha glad I found this after over 25 years of listening to wfmu at all hours. Phillip: I totally used to listen to the Hour of Slack. that was Excellent! Thank you John. anyways never mind, i will keep that to my own nightmares, carry on penfold. i used to sometimes listen to the hour of slack. it was a bit tedious but at a once-every-few-weeks level it was amusing. I always liked the Subgenius's concept of acu-beating. If your left arm hurts you apply acu-beating to your right arm and the left arm starts feeling better. rich i'm cold and have to get under blankets so i'll say Thank you now even though i'll still be listening indefinitely. Ian: That would be heartbreaking. Kind of how I feel about Doctor Who. It's been Americanized.